Waking up at 5am on a Saturday morning would normally not be a great thing to happen! Today though, was the exception to that rule. Today, we have the bluest sky, the shiniest sun and a wonderful gentle breeze. 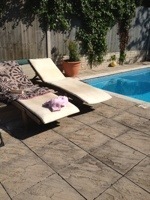 my lie on the lounger with my book day, my eat barbecue food until you burst day!